Installation view of Pouran Jinchi: A Survey at Art Projects International, New York, 2008. A Hair perhaps divides the False and True; Yes; and a single Alef were the clue. 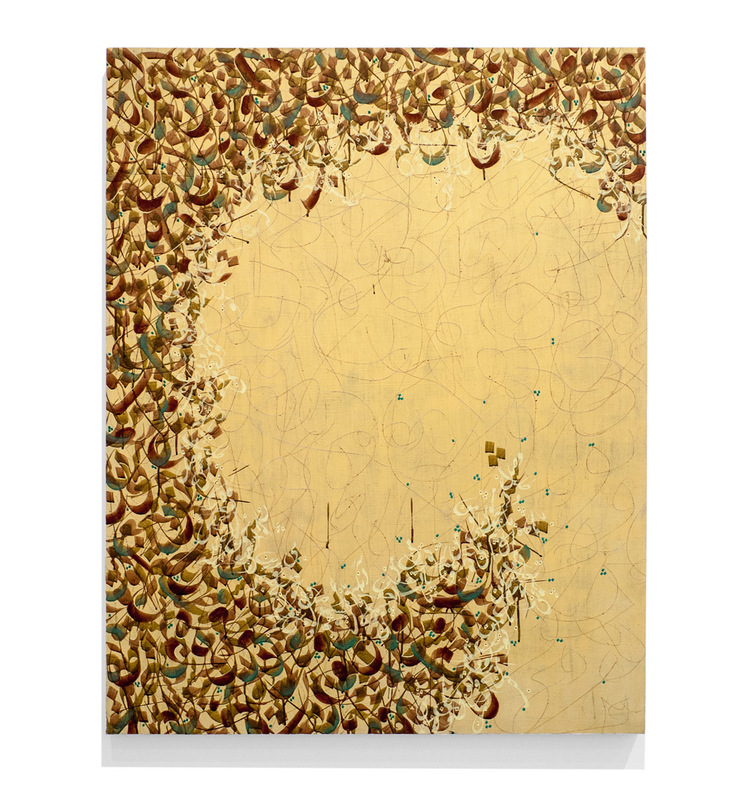 Art Projects International (API) is pleased to present an important survey of paintings by the Iranian-born New York artist Pouran Jinchi. 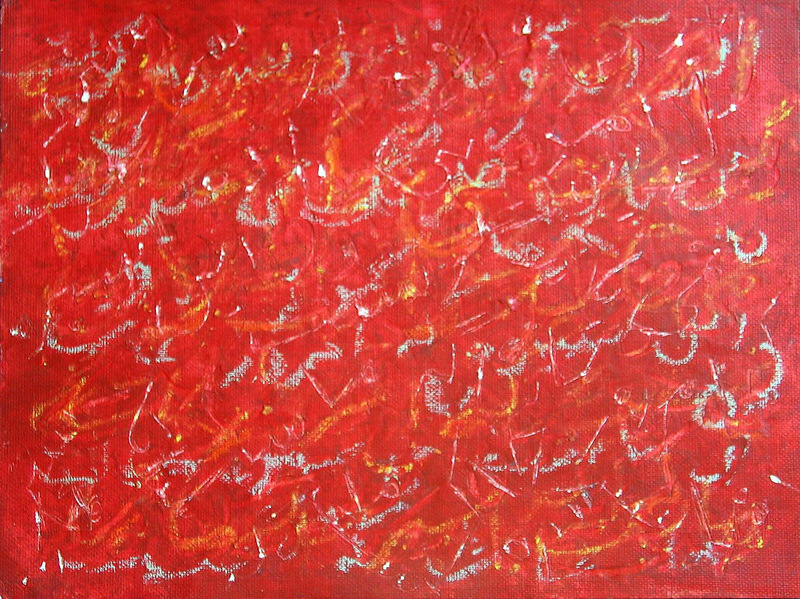 Her Poetry Paintings, Rubaiyat Series, Antworks, Derakht Series, and Alef Series will be shown together for the first time. 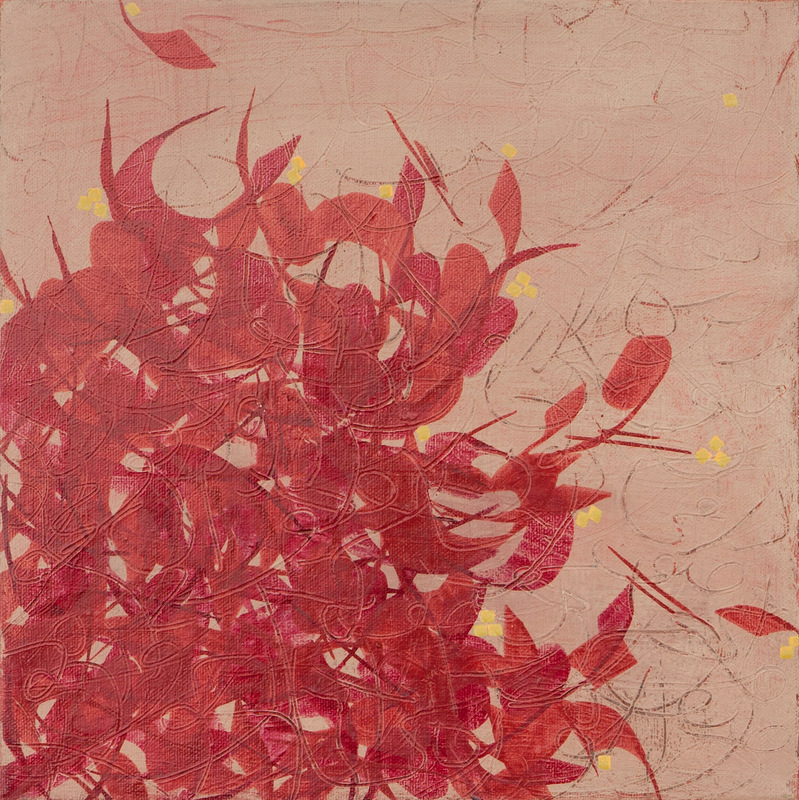 In these works symbols, symbolic marks, and calligraphic gestures are unbound. 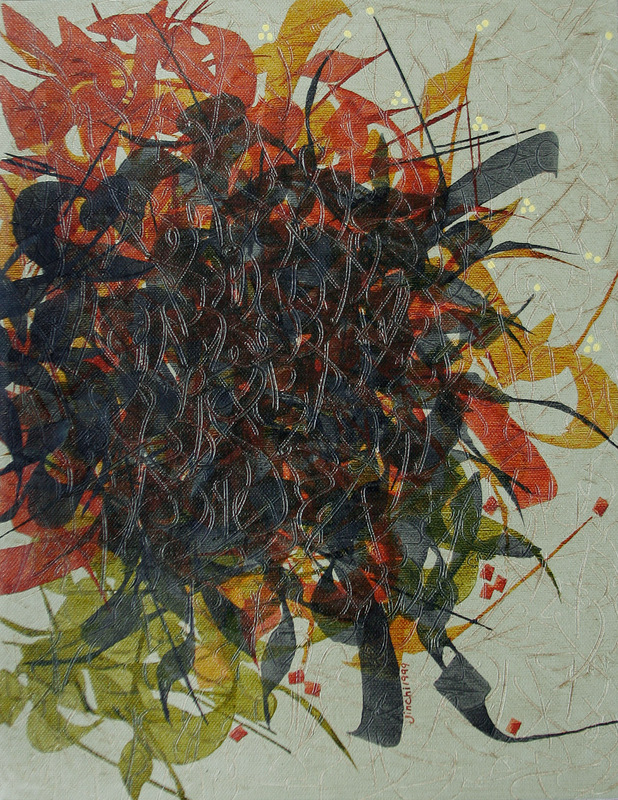 For more than a decade Jinchi has painted from poetic texts including those of the Rubaiyat of Omar Khayyam. 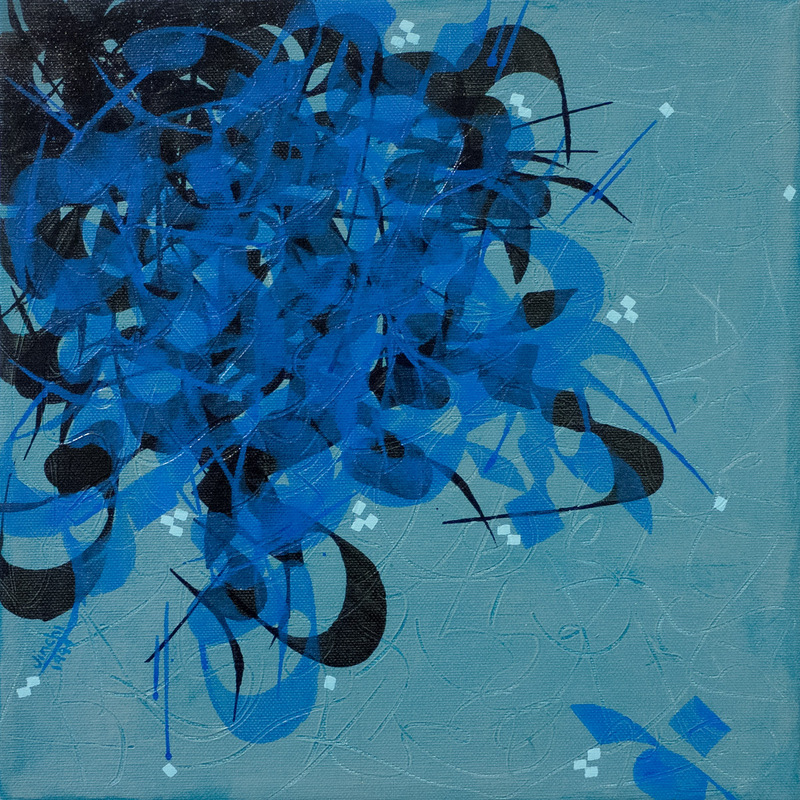 In these series her marks, against strongly colored grounds, suggest calligraphic Farsi but they follow more the logic of nature on a grander scale than that of language. 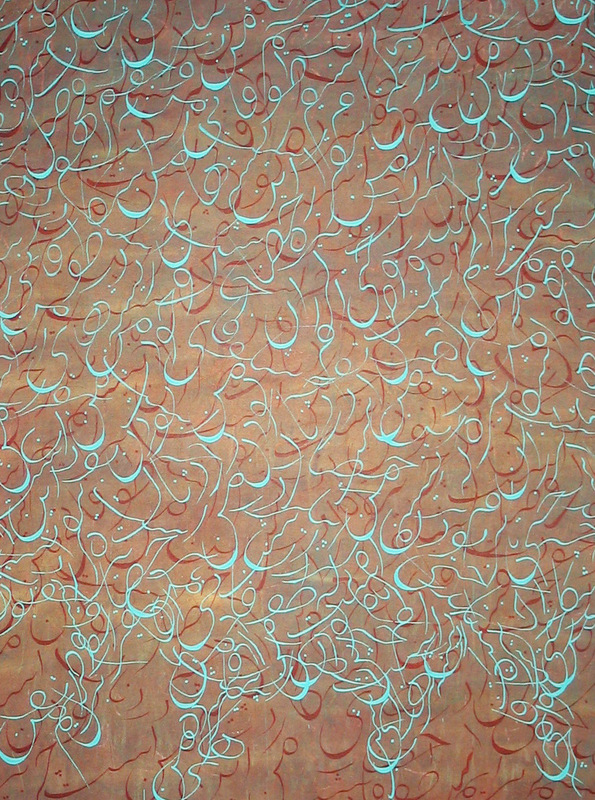 Swirls and groupings lead the eye from specific, energized strokes to vibrant, flowing, and immemorial, orchestration. 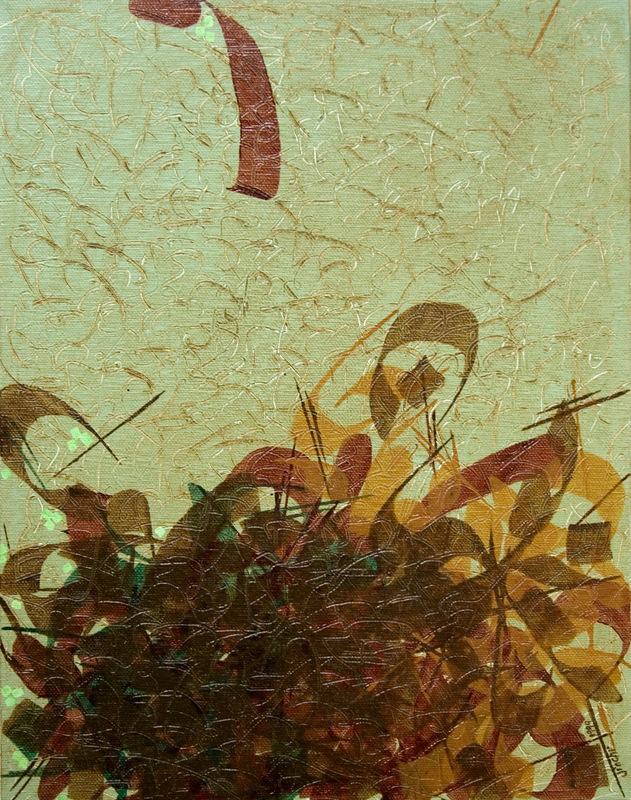 In her Derakht (“tree” in Farsi) series nature is explicitly referenced. A variety of stylized marks suggesting text are compiled into trunks and branches and, then, the whole, the tree. The building blocks of nature become those of culture, and all the while the paintings live as images independent of metaphor. Related in its explicit reference of nature is the Antworks. Again the stylized-part becomes the aesthetic whole and then the whole breaks down back to fundamental units, here the depiction of ants, before re-flowing whole again. 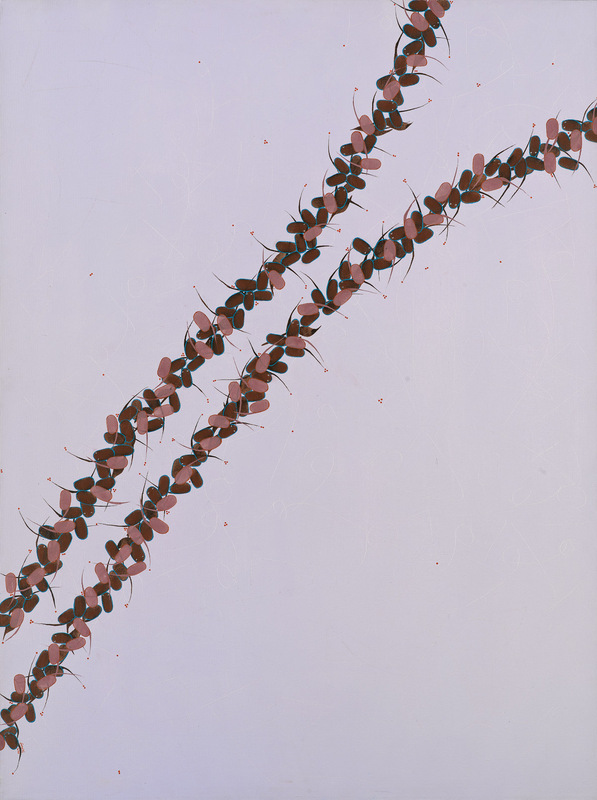 With the introduction of the ant, instead of the letter, Jinchi brings culture’s valence and aspect to the fore. Jinchi gently suggests that the individual artist (not to mention the individual artwork or, even, creative gesture) may contribute to the superorganism of culture without chance of knowing place. 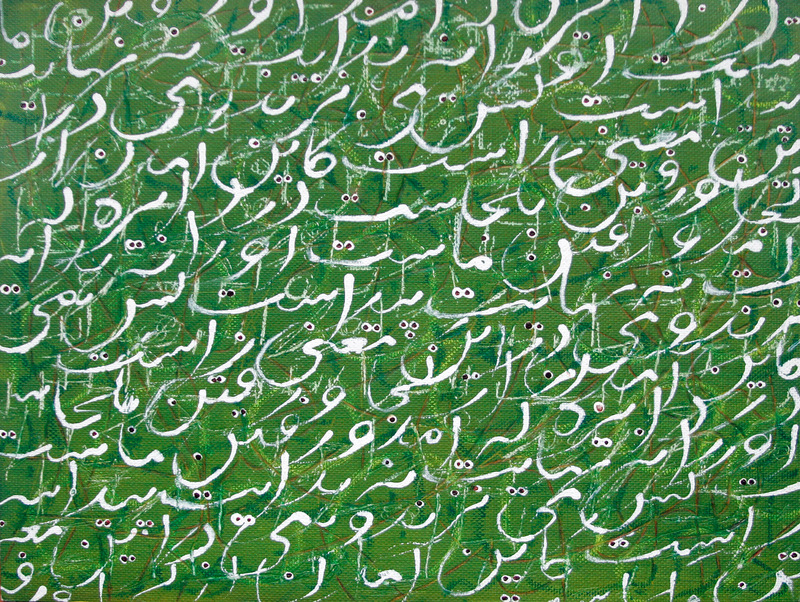 The Alef (the first letter of the Farsi alphabet) series is 96 paintings of the 32 Farsi letters. As Khayyam offers, one letter could be the clue to the nature and fate of civilization–of culture. The function of language is negated. If, ultimately, words do not convey meaning then the study of a letter is equivalent to studying an ant or leaf or the dash of a calligrapher’s pen. 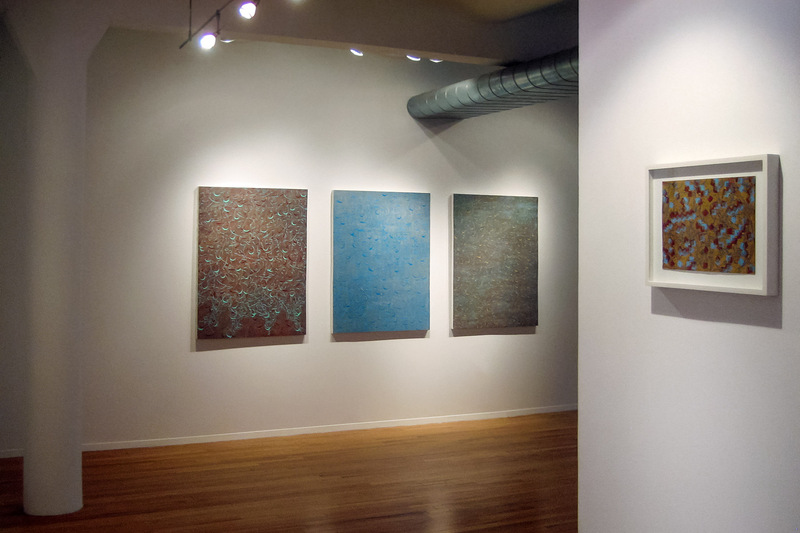 Jinchi’s paintings provide space for these thoughts. 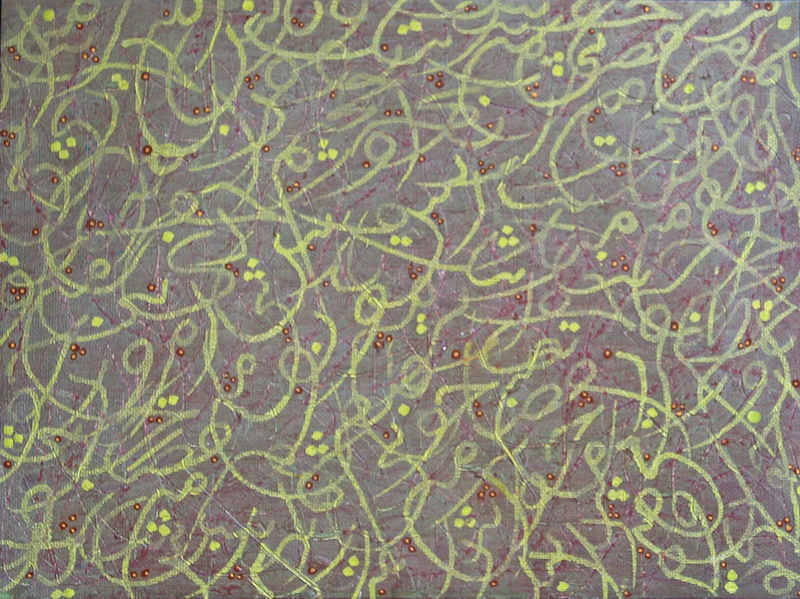 Balanced between luscious materiality and abstraction Jinchi’s Farsi letters are ready, at the viewer’s bidding, to morph into transcendent idea. Jinchi’s series exist in conversation. 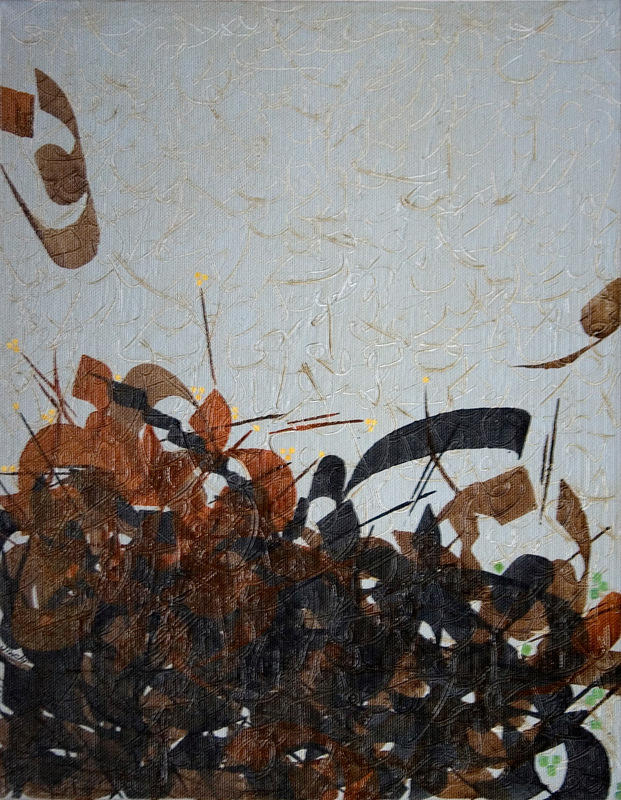 The afterimage of a line of text is carried forward by a column of ants and one stroke of one letter in a Poetry painting is echoed in the isolated alphabet of the Alef series. She once trained in calligraphy–in the art of representing the infinite in subtle gesture. Sign stands in for idea and artful depiction can replace both. 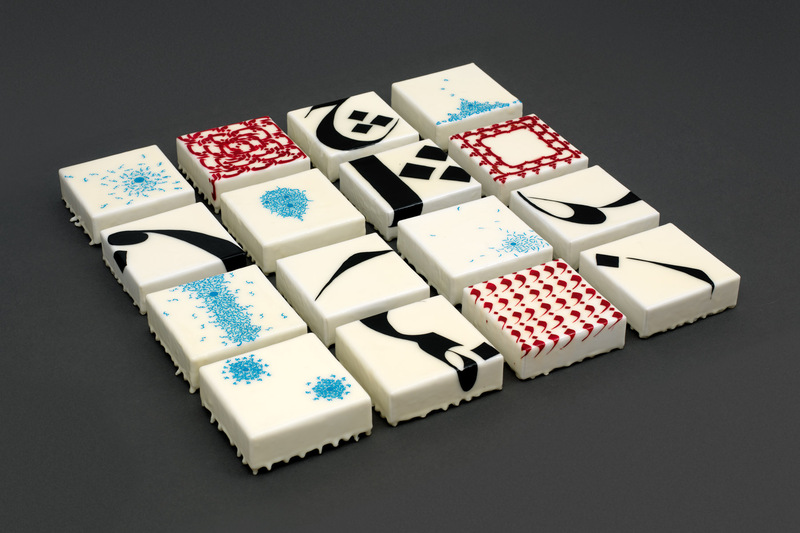 Whether in these series or others that reference Iranian architectural tile design or the meeting of Islamic tradition and the international, fashion marketplace, Jinchi lays bare the naturalistic foundation of culture and art. Born in Mashad, Iran. Lives and works in New York City. She received her B.S. in Civil Engineering at George Washington University, Washington, DC; Studied sculpture and painting at the University of California, Los Angeles, and Studio Painting at The Art Students League of New York. 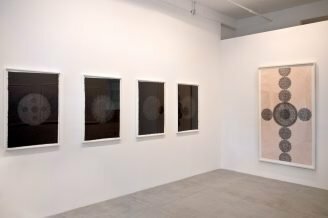 Recent Exhibitions: Pouran Jinchi: Fabricated, The Third Line, Dubai, UAE (2008); Contemporary Calligraphics: Three Artists Image the Word, Binghamton University Art Museum, Binghamton, NY (2007); Recitation, M.Y. 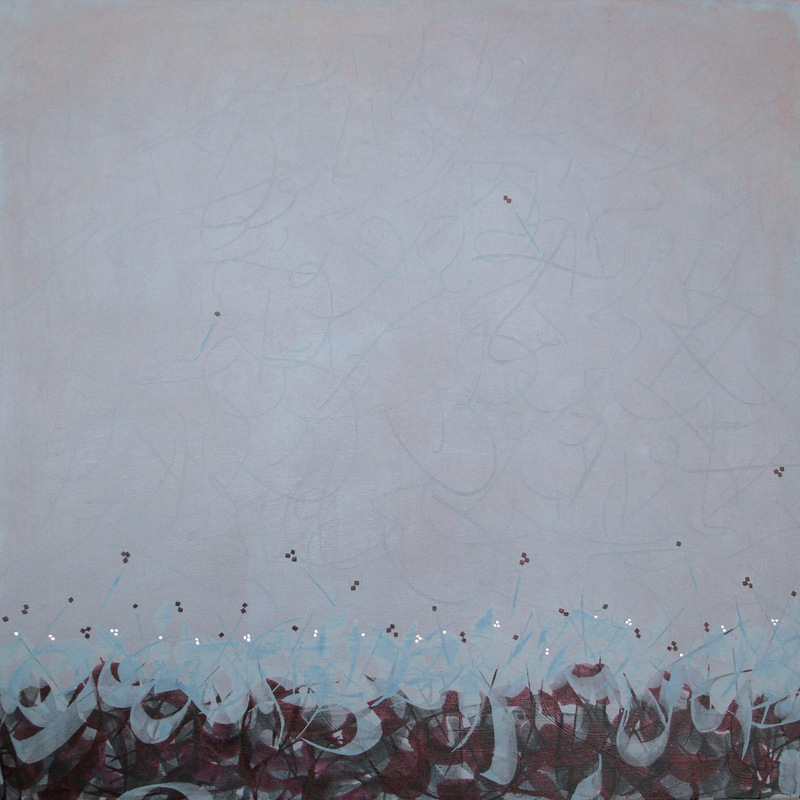 Art Prospects, New York, NY (2007); and Gulf Art Fair, Dubai, UAE (2007)). 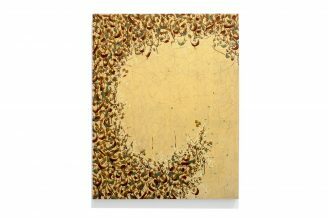 Selected Collections: Arthur M. Sackler Gallery, Smithonian Institution, Washington, DC; Federal Reserve Bank, New York, NY; and Sprint Corporation, Kansas City, MO. Selected Bibliography: “Countries: United Arab Emirates,” Art Asia Pacific Almanac 2008, reproduction, vol. 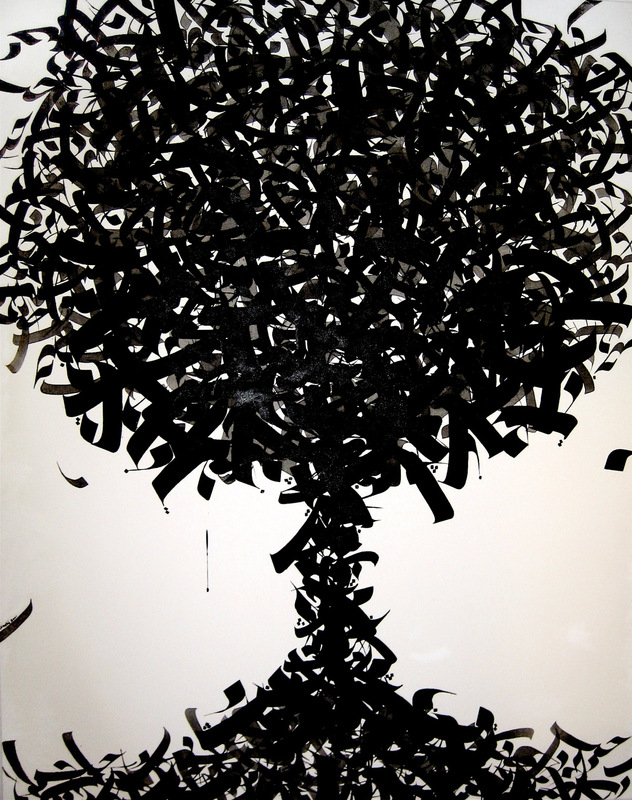 3, 2008; “Art & Culture,” Time Out Dubai, reproductions, January 17 – 24, 2008; Wilson-Goldie, Kaelen. 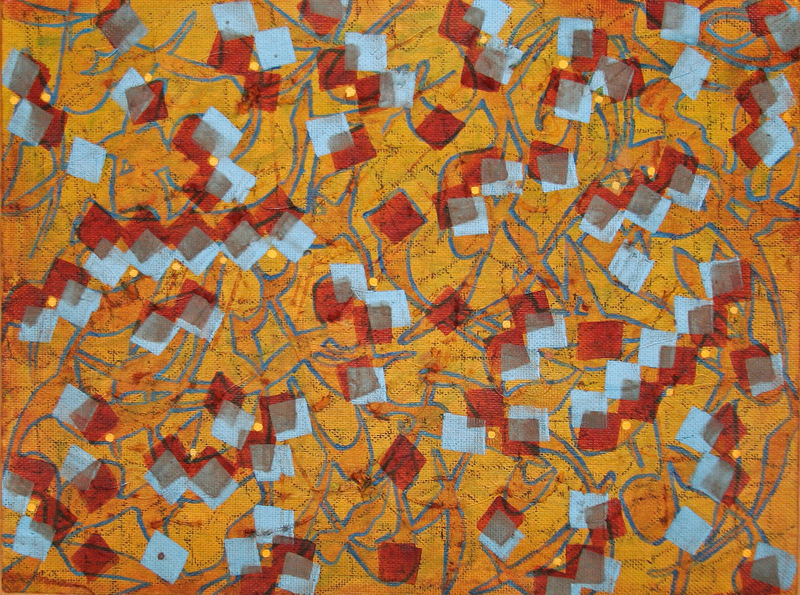 “Desert Oasis – or Mirage?” Art + Auction, reproduction, October 2007; Ekhtiar, Maryam. 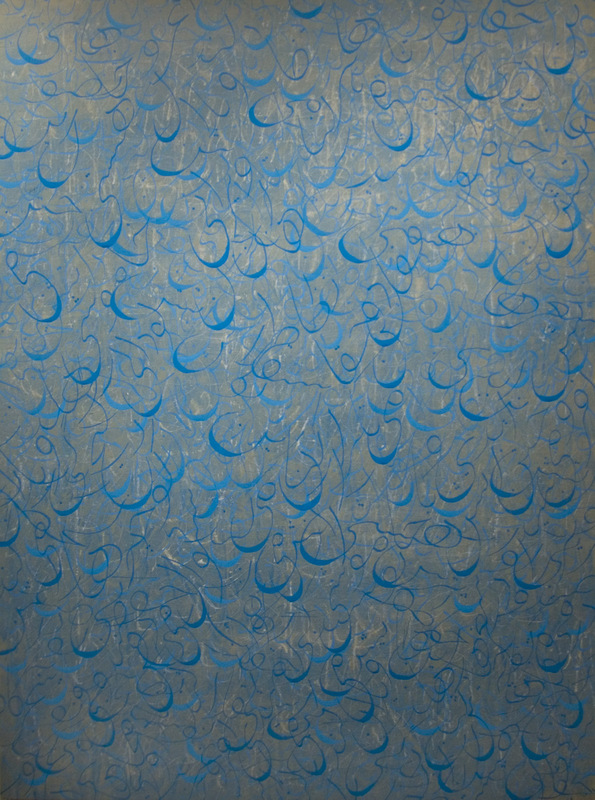 “Practice Makes Perfect: The Art Of Calligraphy Exercises (Siyah Mashq) In Iran,” Eastern Art Report, 2006; Goodman, Jonathan. 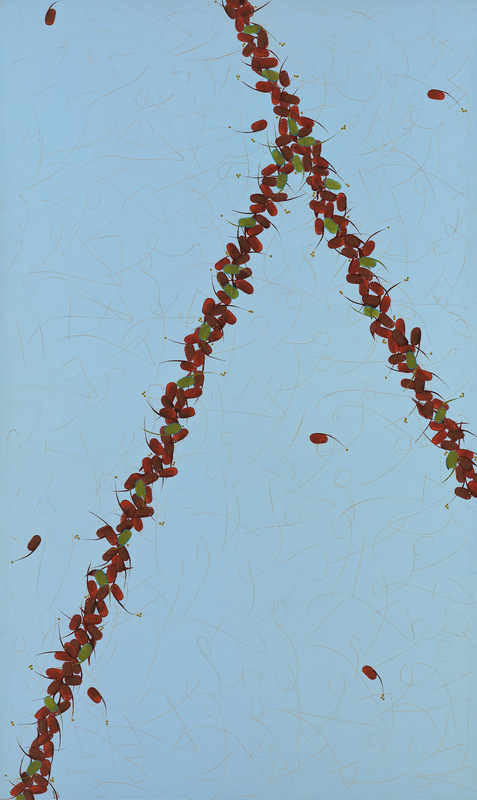 “Pouran Jinchi at M. Y. Prospects,” Art in America, October 2002; Goodman, Jonathan. 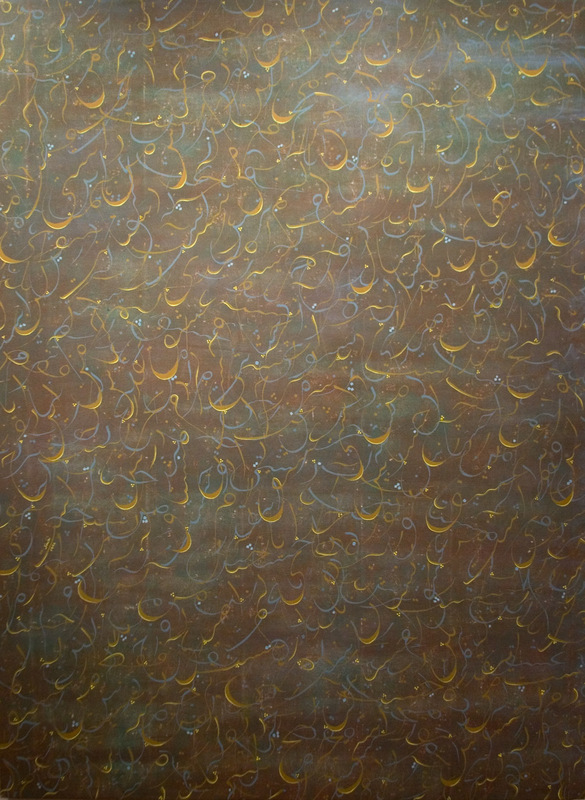 “Pouran Jinchi,” Art Asia Pacific, review, reproductions, issue 32, 2001; Cotter, Holland. “More Abstraction,” The New York Times, Fine Arts & Leisure, January 21, 2000; “Short List,” The New Yorker, December 27, 1999.